Kamanaka Hitomi was a late comer to nuclear issues, but in a short time she has had a huge impact on the grass-roots movement in Japan. Her film Rokkasho Rapsody has drawn in thousands of people who had never previously been involved in the movement, including lots of young people. It is one of the key factors in the last few years that have vitalized the campaign to stop the Rokkasho Reprocessing Plant (see photo below). Rokkasho Rapsody shows ordinary people in the region around the Rokkasho Reprocessing Plant, living out their daily lives and working through the dilemmas that the existence of the plant raises for them. It also looks further afield to places such as Sellafield in the UK, the site of another reprocessing plant with which the Japanese nuclear industry has a long and troubled relationship, to understand the issues raised by the Rokkasho plant. It is a film that asks us to do something. Thousands of people in Japan and beyond have taken up the challenge. The film has now been translated into Korean, Chinese, France and English and it has been screened over 550 times since it debuted in 2006. 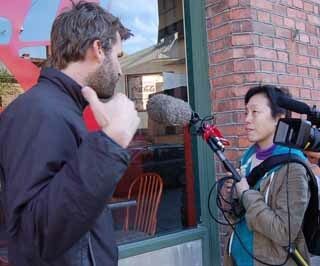 Hitomi started making films in Japan, then went to Canada to study further, supported by a governmental arts grant. 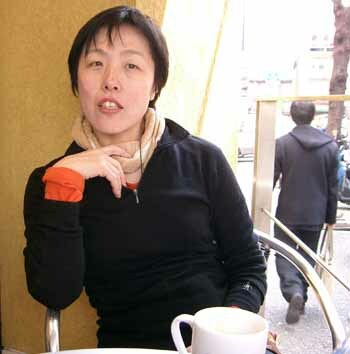 She returned to Japan in 1995 and gradually moved into TV, eventually spending ten years making documentaries for NHK, Japan's national broadcaster. After the insecurity of life as a media activist "using media to criticize media", she thought it was great not to have to worry about money any more. It was also great to be able to make lots of documentaries that were seen by millions of people. But at some stage she realized that there was a down side. She found that tailoring her documentaries to suit NHK was killing her artistic creativity. Nevertheless, it was a program that she made for NHK that drew her into nuclear issues. In 1998 she made a program about the effects of depleted uranium (DU) left over from the first Iraq war. NHK wasn't happy with the contents, but she managed to come up with a compromise and the film was shown on TV. It was the first time the DU issue had been raised on TV in Japan. But although the film dealt with the problems of radiation, it was not until much later that Hitomi realized that this DU was a waste product from the nuclear energy industry. Eventually she broke away from making TV programs. She had become very interested in the problems of radiation, so she decided to make a film about Hibakusha. The film won awards and the topic was relatively easy to sell in Japan, so she was able to form a network of people who screened the film in their communities. This was the basis of the network which took up her next film, Rokkasho Rapsody. There was something about Rokkasho Rapsody that was different from many of her previous films. It inspired people to take action in their own lives. People sensed a connection between the issues raised in the film and their daily lives. 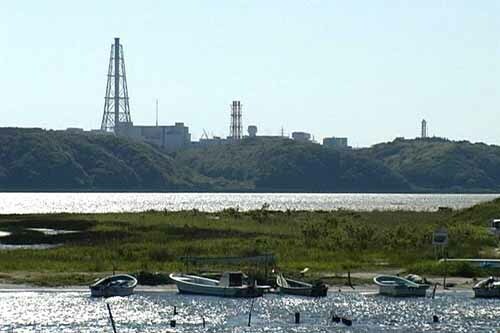 They realized that the radioactivity that contaminates the sea and air around Rokkasho (and that will contaminate a much wider area if there is a major accident) is connected to our use of electricity. The same connection exists with the DU that contaminates the battlefields of Iraq, but Hitomi was not aware of that connection when she made the earlier film. Her focus was on the plight of the victims, rather than the origin of the DU. Had she drawn the connection, perhaps it would have been even more difficult to persuade NHK to show the film. It would be a mistake to think that the network that Hitomi has created is sustained simply by the inspiration from the film itself. Hitomi's outgoing personality and her enthusiasm are key ingredients of her success. People are drawn to her light. But there are also other factors. One is her method of releasing "video letters" between films. It takes a long time to make a full-length film, so by the time the film is ready some of the material is quite old. These video letters are a way of getting material out faster. They also provide continuity to the network, which might lose some of its impetus if it had to wait for the final film to be completed. Currently Hitomi is working on a new film with the tentative title The Hum of the Honey Bee and the Rotation of the Earth. The first in a new series of video letters, using footage taken for this film, was released in February this year. It was a wonderful testimony to the spirit of the people of Iwaishima Island, almost all of whom are opposed to the planned Kaminoseki Nuclear Power Plant. The plant is to be constructed on the shores of the Seto Inland Sea, just 4 kilometers across the water from Iwaishima. The highlight of the video letter was a stunning ritual dance by Takashi Yamato (see Who's Who in NIT 125) on the prow of a fishing boat, as part of the island's traditional festival. The latest video letter also showed alternative approaches to energy being introduced in Europe, with a particular focus on Sweden. Hitomi wants to show broader connections between nuclear energy and the environment. There is still a perception in Japan that nuclear issues are separate from wider environmental and social concerns. Hitomi would like to contribute to breaking down that perception. By enabling her to connect powerfully and personally with her audience, her approach to making and promulgating her films is ideally suited to the purpose. * Philip White is the editor of Nuke Info Tokyo. Group Gendai Films Co., Ltd.